Getting endorsements from influencers is a way to build your credibility and gain more bookings from brands. Give endorsements to influencers you know or influencers you think are awesome. They will receive the endorsement with your influencer name visible and this gives you an opportunity to receive endorsements in return! 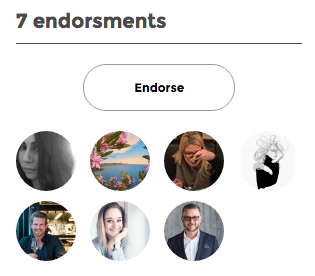 To give an endorsement, go to the influencer's page that you wish to endorse. Click on the Endorse button on the influencer's profile. Your profile picture will appear on the influencer's site in the endorsement section, as shown below. The endorsements will also be visible when brands are searching for influencers.